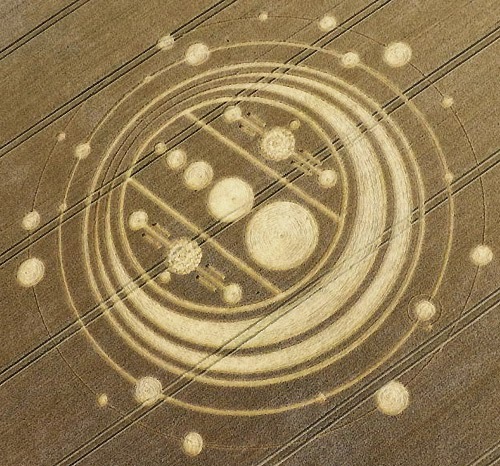 At first glance, one might see crop circles as a modern phenomena, when in fact sightings of these mysterious designs date back many hundreds of years ago. The earliest known reports are documented from the ninth and twelfth centuries, well before complexities leave impressions seemingly at random in today's in farm fields across the world. Early reports described flattened crops in oval and circular ring patterns, sometimes similar to natural phenomena such as fungus rings on a much larger scale. The mystery of modern patterns however, tend to indicate a form of intelligence is behind their design, though the purpose is not clear. One popular theory proposes crop circles are actually cryptic forms of an alien communication, that an otherworldly intelligence is attempting to establish contact with the human race by means of large mathematical pictographs temporarily etched into the countryside. 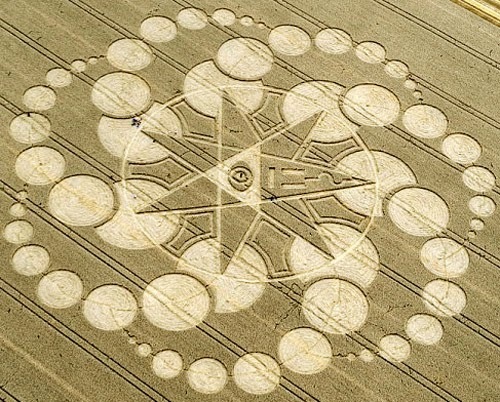 Suggesting crop circles are alien messages fulfills a level of convenience to fringe UFO researchers, as a secondary form of evidence, perhaps a physical representation corroborating existence of unidentified flying objects with undeniable imagery. The association of crop circles to unidentified flying objects is possibly made as an innocent explanation for why UFO sightings occur, placing aliens as non-threatening beings and implying no direct harm to the human species; communicate first, then form action based on the gained knowledge respective to said communication. With this, a secondary concept is easier to believe, to say an alien race is here studying mankind; further to the point, it's merely curiosity and will move on without interfering with daily human life. Formations randomly appearing in farm fields demonstrating a mathematical form of intelligence have long been accepted as crop circles, and the term itself manages to explain these complexities as simple as possible. The geometric designs principally incorporate circular shapes, or are built upon a circular base. Without the true purpose of crop circles clearly defined, perhaps a more accurate terminology is UGF, or unidentified ground formations; to embody the phenomena as a whole. Yes, there are many documented cases of individuals and groups creating crop circles as a form of publicly displayed artwork on a grand scale with innocent intentions. There are a few cases as well, whereby the circles are created to prove a more malicious point, as attempts to prove all circles must be hoaxed if said example is. Or possibly, man-made circles are actually mimicking messages from a much larger design. In these scenarios we are faced with confusion between what is real and what is man-made. A larger number of crop formations, however, are indeed unexplained and fuel scientific curiosities with highly sophisticated and complex mathematical designs. The caveat here to keep in mind is, that it's difficult to rule a sophisticated crop circle as otherworldly given the intelligence of mankind and advances in technology. How are crop circles made? Exactly how an amazing crop circle is created continues to be a significant factor in understanding the mystery. Complex geometrical patterns are effective at defying logic and establishing an alternative intelligence might be involved. One known method of making crop circles involves wooden planks, ropes, and an army of people certainly are capable of flattening crops into circular designs and patterns with a predetermined goal planned out and coordinated beforehand. Aside from the rope and board method, there is another theory which demonstrates the possibility of human intervention to create crop circles. The use of specialized equipment carried by high altitude experimental aircraft or even possibly satellite technologies. This theory states that altering air pressure at the ground level from an advanced external source may be leveraged to create shapes and patterns on Earth with subsonic audio frequency waves. Perhaps the theory also explains sightings of UFO's in conjunction with the appearance of new circles, as this pressure wave travels through the atmosphere to and from a target point resulting in an optical illusion, as balls of light and disc shaped rings. Using air pressure to form circular patterns is similar to other theories of origin, such as natural wind and electromagnetic currents congregating in specific areas to create the shapes later witnessed. The idea of natural phenomena creating fractal shapes is not unusual, and in fact these types of patterns are found commonly in flowers and in the formation of metals and crystals. 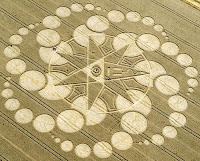 Yet, by human interpretation, crop circles tend to lean toward intentional patterns more than natural phenomena. Research examining soil and biological matter uncovers even further mystery which for the time being seems to lend merit to the otherworldly source theory. In some instances, the crops appear to be genetically modified and contain trace elements not found in the surrounding area outside of the circle. Combine this with sophisticated geometric designs and it's understandable to think an alternative source might be responsible.